Wilson Daily Times, 28 November 1938. Eighty years ago today, Richard Sheridan and Ed Nicholson were fined for trespassing after protesting the exclusion of taxi drivers from Wilson’s bus station. Miley Glover and Dr. Mallory A. Pittman leased a building to various bus companies for use as a bus station. Glover and Pittman also leased “taxi rights” to the building to J.D. Peacock of Goldsboro, who barred any other taxi drivers from seeking fares on the premises. When Sheridan and Nicholson attempted to pick up fares at the station, they were arrested and charged with trespassing. Their lawyer argued that the station owners had created a taxi monopoly in contravention of state law, but the recorder (magistrate) did not agree. Each man was assessed a five-dollar fine. The 1941 Hill’s Wilson, N.C., city directory reveals two taxicab companies in Wilson. J. Clifford Peacock and George B. Patrick owned Oak Cab Company, based at the bus station. Hugh T. Foster owned Taxi-Cab Service at 508 East Nash. Oak Cab’s arrangement with Glover and Peacock meant that, effectively, black drivers had no access to white patrons arriving in Wilson by bus. It also meant that black riders had to leave the station’s premises to hail a cab. Per the nomination form for Wilson Central Business-Tobacco Warehouse District, the taxi stand and bus station at 307 East Green Street were built for Miley Glover in 1937 and 1938. The bus station was one of Wilson’s few Art Deco buildings. 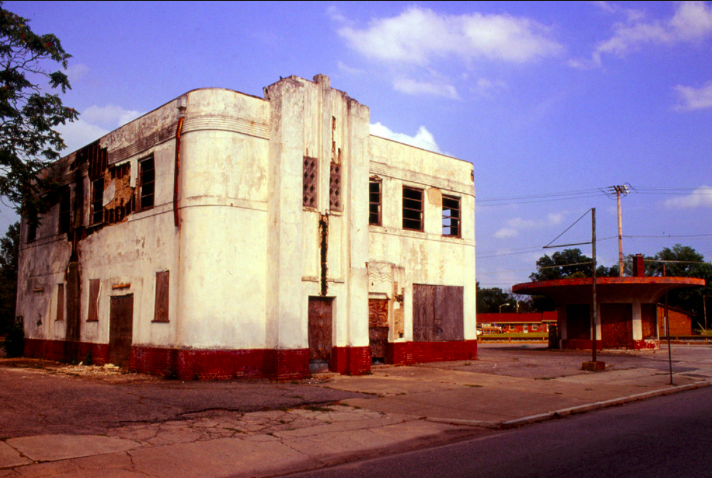 It operated into the 1990s and was demolished after the city built a public transportation hub on Nash Street. Richard Sheridan — Richard Sheridan, 26, son of Richard and Fannie Sheridan, married Beatrice Bullock, 19, daughter of Alice Bullock, on 1 September 1935 in Wilson. Sheridan registered for the World War II draft in Wilson in 1940. Per his registration card, he was born 20 September 1910 in Maxton, N.C.; resided at 1115 Atlantic Street, Wilson; his contact was mother, Fannie Sheridan, 1115 Atlantic; and he worked for traveling salesman John Whelan. Photo of bus station and taxi stand courtesy of Dean Jeffrey at Flickr, 2001.